4 and 5-star hotels had the highest occupancy rate in May, at 25.6%, according to data of Bulgaria's National Statistical Institute (NSI). 3-star hotels had an average 17.1% occupancy rate, while hotels, motels, camping sites, mountain chalets and other establishments for short-term accommodation with 1 or 2 stars reported an occupancy rate of 14.3% in May. The average occupancy rate in Bulgarian short-term accommodation sites in May was 19.8%. In May, a total of 1932 sites offering accommodation were available in the country with a total of 187 400 beds, the number of beds up by 54.9% from April. The total number of nights spent in all types of tourist accommodation establishments in Bulgaria was 992 900, up by 51.3% from April 2012, which can be attributed to the high number of official holidays during the month. In May, 4 and 5-star hotels registered the highest increase (75.6%) in overnight stays, while sites with 1 and 2 stars registered the smallest increase (9%). In May, the number of guests who spent nights at tourist accommodation sites went up by 24.7% on the month to 381 100. The relative share of Bulgarians was 58.3% of all guests, the majority of Bulgarians having booked overnight stays at 1, 2 or 3-star sites and spending 2 nights on average. In May, the total number of foreigners who spent nights at Bulgarian short-term accommodation establishments was 158 800, up by 52.6% on the month. 70% of the foreign nationals who stayed in Bulgarian accommodation sites went for 4 and 5-star hotels. 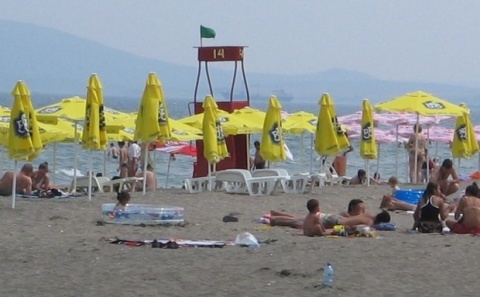 Foreigners spent an average 3.5 nights at Bulgarian short-term accommodation sites.